How did you develop an interest in Optometry and why did you choose to study BSc Optometry? 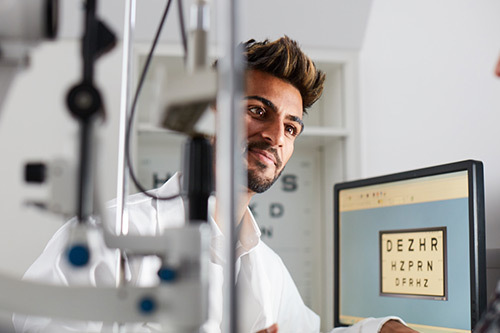 I was always fascinated by the human body from an early age and when achieving top grades in subjects such as biology, physics and maths, I was recommended by a friend to consider BSc Optometry. When researching further, I realised the big contribution optometrists make to people’s lives, potentially saving people’s sight and even life in certain situations. I wanted to help with these as much as possible, hence I chose Optometry as my first choice. London is such a diverse, busy city - there is never a dull moment. What attracted me to City was the fact that the University has top teachers with excellent backgrounds, they are all specialists in their subject. I wanted to go to the best place to learn and become the best practitioner that I could possibly be. Being able to show my independence. It is hard sometimes living away from family, but I have developed so much as a person and feel confident when approaching patients in my 3rd year. Yes, I have been a part of the Sikh football team for which we have won the cup for 2 years and reached the final in the 3rd year. I also box for Angel boxing club and I am representing City University of London in February for my 9th competitive fight. I think it’s highly important to attend freshers fair and get signed up to whatever extracurricular activities interest you. For socialising, development as a person and fitness/health reasons! Meeting new people very similar to myself on the course and understanding optometry as a whole process. City is a very friendly university which made me feel welcome early on. Teaching has been excellent. The teachers have a strong passion and are very good at explaining things on a whole. City sight has been excellent- with modern facilities and packed with patients, it is an excellent place to learn and refine your clinical skills. Could you tell us about your placement; where have you been based? What have you enjoyed most? What aspects have you found most challenging? Moorfields Eye Hospital has been inspiring to say the least – from working with ophthalmologists and seeing surgery, it really puts your theory into practice. Some aspects have been challenging- particularly seeing patients in worse case scenarios, for example, suffering from glaucoma and potentially becoming blind in both eyes. It is good to be exposed to this, as it helps you understand and appreciate how emotional this profession can be and helps you to tailor your care to the patients at hand. This placement helps me to understand more about the hospitals management of patients and I need to know about this for my professional career. Seeing patients in Pathology and elderly patients. I plan to work at boots opticians in Brighton for pre-registration, which is a compulsory extra 1 year that you must pass in order to qualify as an Optometrist. Then I would love to locum for a couple of days in the week and travel the world in my spare time. What would be your advice to anyone considering studying BSc Optometry? If you have a passion to help, interested in medicine and are a very social person I would strongly recommend this course. It is such a diverse subject that you will develop yourself to be a credible healthcare professional, one that the University and your family will be proud of.